Thanksgiving is around the corner - it's time to share the pie! O2 Fitness Seaboard is jumping in on this sweet tradition that was started three years ago by Mary-Allison Raper and Kathryn Holding. You may have seen the Share the Pie signs around town and wondered, "What do pumpkin, chocolate, and pecan pies have to do with giving back to the community?" Local bakers from around Raleigh donate delicious pies for your family to enjoy for Thanksgiving. 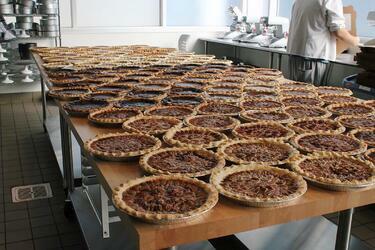 Each pie is only $26 and all of the proceeds benefit Step Up Ministry and Alliance Medical Ministry. Barn, Royale, Vidrio, Irregardless Cafe and The Pit are just some of the amazing pie-baking volunteers for the 2018 campaign. Get your pie today and pick up at the O2 Fitness Seaboard location or one of the other 7 pie pickup locations on November 21st from 9 a.m. - 3 p.m.